The purpose of the VTW Dynamic Tire & Wheel Balance System is to help assure the tire & wheel quality and vehicle ride quality. This is done by measuring and marking tire & wheel assemblies according to static, couple and upper and lower plane imbalance and then by manual application of corrective weights. All Micro-Poise dynamic balancers utilize a hard bearing "force measuring" imbalance-sensing system in conjunction with microprocessor based electronics. There are several advantages to this system. The force measuring system is a durable design and accurately measures the imbalance in a wide variety of tire & wheels. The VTW Dynamic Tire & Wheel Balance System is a fully automatic machine used for 100% checking and measuring in production. It can automatically adjust to different tire & wheel sizes and test conditions while processing a variety of tire & wheels with various wheel diameters, outside diameters, widths, and weights. The VTW is capable of testing passenger, light truck and medium truck tire and wheel assemblies. Static Imbalance in a tire & wheel can create disturbances such as tire & wheel bounce. Static imbalance can be caused by a heavy spot (or light spot) on the tire & wheel assembly. This condition will induce an up and down force into the vehicle on every tire & wheel rotation. These forces are amplified as the speed of the vehicle increases. Couple Imbalance in a tire & wheel can create disturbances such as tire & wheel wobble. Couple imbalance can be caused by an improperly mounted tire or a heavy spot (or light spot) in a tire & wheel assembly. This condition will induce a side-to-side shake or wheel shimmy into the vehicle on every tire & wheel rotation. These forces are amplified as the speed of the vehicle increases. Upper, Mid and Lower Plane Imbalance is the amount of weight required to correct for both static and couple imbalance of the tire & wheel as described earlier. Tire and Automotive manufacturers set limits on the acceptable values of static, couple and per plane imbalance forces to assure good ride quality and customer satisfaction. The VTW Dynamic Tire & Wheel Balance System provides for the measurement and marking of tire & wheels to allow an operator to add corrective weight to meet these requirements. Typical configuration of the Model VTW Dynamic Tire and Wheel Balancer. This machine is capable of being a one person operation or a two person operation. The machine is designed for maximum access to the machines main components while also keeping the operator and bystander’s safe. Protective guarding with access doors around the machine, open when the machine has been safely stopped. This allows easy access to the entire machine. Precision multi-jaw tooling and an isolated hard bearing balance station make the VTW stand out among the rest. This innovative technology makes the VTW the dominant tire and wheel dynamic balance machine in the industry. The key option for the Model VTW is the Weight Apply Turn-over Fixture. The weight apply turnover fixture, as shown here, assists the weight apply operator during the weight apply operation. The weight apply operator is not required to position, lift, or turn over the tire & wheel assembly for weight application. 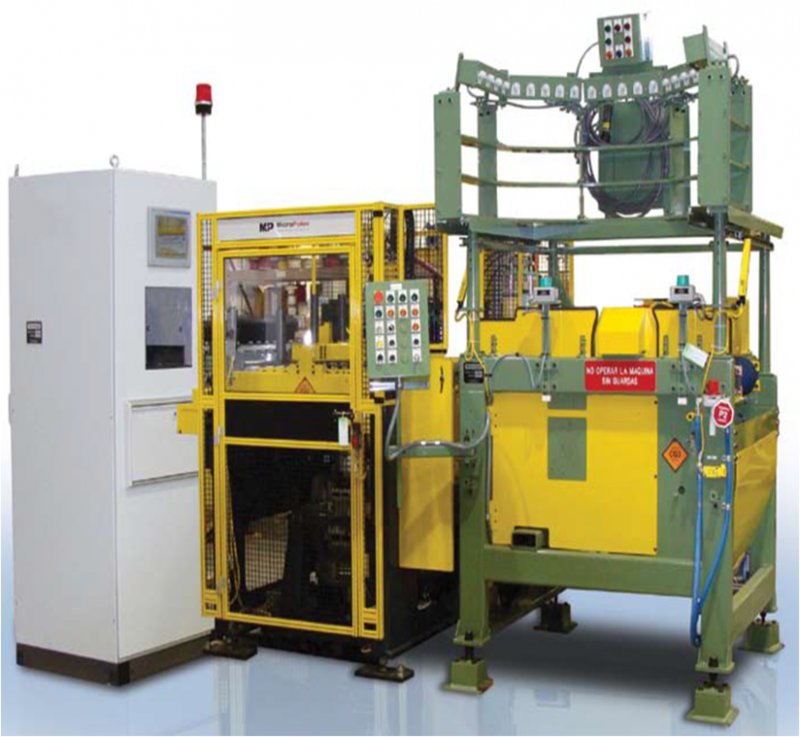 The turnover fixture, under control of the operator, will position the tire & wheel assembly in front of the operator for upper plane weight application. The operator can then command the turnover to turn the assembly over 180* by pressing the palm buttons for lower weight application. The operator can then either release or turn the tire & wheel assembly back over.